Earlier this month, I downloaded and played through the Nioh demo from Team Ninja. As many people on Facebook, Twitter, Reddit and other social media have noticed, the game bears a striking similarity to the Dark Souls series. There are obvious differences, of course: Nioh's setting is feudal Japan, Dark Souls is a medieval fantasy land, Nioh has you play as a specific character with a name, Dark Souls lets you create your avatar, etc. But these are relatively superficial differences, and after a few minutes (which grew into hours), it was obvious to me that Nioh was attempting to cash in with its own variant on the Souls formula. There's a tendency in most forms of entertainment to label anything that takes themes and ideas from its contemporaries as a copycat, a rip-off, or most derogatory of all, a clone. So is Nioh just a Dark Souls clone? Doesn't matter. Because even if it is, I don't think that's bad. I started my time in Nioh with Dark Souls and Bloodborne as my points of reference. When my samurai would run out of ki and have to catch his breath, I would grow frustrated. "Dark Souls wouldn't make me stop," I'd mutter. When the game only let me assign three quick-use items instead of the half-dozen or more I'd become accustomed to, I likewise felt constrained. "Dark Souls would let me equip more items." It was like being an angsty teen with a step-parent that was trying to bond with me, and I was refusing to budge. I even (half-jokingly) tweeted, "Time to play the Nioh demo, AKA can I force myself to like a game I hate." You hear that? You're not my real dad, Nioh!! But it's not like Nioh was the first to build its foundation on the backs of what came before. PlayStation All-Stars was clearly modeled on Nintendo's Super Smash Bros. series. Darksiders and Darksiders 2 are the best M-rated Legend of Zelda games you'll ever play. Saints Row will never have GTA's budget, but it's got the series' DNA pumping through its veins. Even Blizzard's ultra-successful Warcraft and StarCraft universes trace their lineages back to Warhammer and Warhammer 40K. Ironically enough, a game's nature as a rip-off, knock-off, copycat, or clone is what gives the developers freedom. 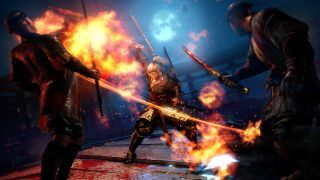 Because Nioh is structurally similar - but not beholden - to the Dark Souls formula, it can experiment; it can do things that traditional Souls fans simply wouldn’t accept. Nioh can add spirit guardians, weapon stances, ki management, a new setting, a combo system, and other little touches that set it apart. Without potentially years of history needing to be acknowledged, an upstart copycat can take risks without damaging a beloved brand. In fact, should the creators of trend-setting games pay attention to the knock-offs, they can learn from them and improve their own product. Midway's Ms. Pac-Man was in truth mostly designed by MIT students who had hacked the original Pac-Man and created "Crazy Otto" - a faster, harder, and all-around better game than the one it was aping. Midway bought Otto from the students and created one of the most beloved sequels of all time. Like they say: imitation is the most profitable form of flattery. Copycats still take risks, mind you. I mentioned PlayStation All-Stars because unlike many derivatives, the game lacks a serious community of diehard players. It probably won't be getting a sequel. Even Darksiders, which has a small but vocal fanbase, is currently stalled. Everyone and their mother was eager to cash in on the MOBA craze popularized by League of Legends and Dota 2, and look at how few of those are still around. The silver lining is that even the failures and flops can give you new insight into the games you know and love. Sonic Shuffle for the Dreamcast was a thinly-veiled attempt at copying the Mario Party formula, and it actually had some good ideas that it brought to the table. Unfortunately, it was also blatantly unfair, with computer-controlled opponents always stealing your best items or whatever would give them a leg up in the level despite a supposedly random system. I might complain about the Mario Party series becoming stale and formulaic, or the selection of mini-games not being as good as in previous entries, but one thing you'll never hear me moan about is the game being unfair. I have seen unfair, my friend, and its name is Sonic Shuffle. Or, to go back to the Nioh/Dark Souls comparison, I don't think I'll ever complain about the Souls series' stamina system again - at least in those games I'm not encouraged to manually reclaim the very thing that lets me sprint and swing my weapon. I'm not saying established series should never change, or that developers shouldn't try to create wholly original concepts that don't piggyback off someone else's success. As with most things, the games industry needs balance. But when experiences like Nioh do come around we should embrace their existence as a copycat, rather than condemn it. Best case scenario, they add something new to a formula you already know and love. Worst case, they'll make you appreciate what you've got.